I, like many people, often have the desire to eliminate the ever-intruding Facebook from my life. My most recent urge to remove myself from the network is really a component of my frustration with technology in the form of smartphones. Specifically, I purchased a cool Nokia phone 3 weeks ago. Last night, however, during a routine update from Nokia, it decided to die and go to Nokia's overcrowded heaven. Just the mess of trying to figure out international warranty between America, Israel, and Nokia Asia has caused me to hate all technological contraptions, from cool phones to useful social networking tools. Facebook has met my wrath before. In the summer of 2008, "The Great Purge" was executed. In an attempt to trim away the fat, I went through my "friends" list with a hatchet, hacking away all those who I couldn't really identify without looking at their picture, or seeing where they went to high school. "Oh, she graduated three years after me from high school? That would mean that... I have no clue who she is." Hack. Out of my 500 some friends, I think I purged around 100 to 150 people that I truly couldn't remember. Stalin would have been proud, and The Great Purge was successful. Within days, however, many of those people 're-friended' me. How they figured out that I had pushed them away I do not know. Maybe they really follow my comments, and after they noticed my disappearance they were worried and fretted over my metaphysical Internet existence. I don't know. It was pretty creepy, though. Since then, I have been careful what I say on Facebook. You never know who is stalking. Well anyway, my extreme frustration with yet another smartphone breaking on me led me to a desire to get back to the basics: email. I can do email. Seriously, I'd prefer snail-mail, since I like to write, but email is also fine. Between Facebook wall posts, comments, status updates, and private messages, I get lost on where to start, on which messages to reply to first, and who said what and when. Email just sticks around until you get to it. Facebook, as I've experienced it in the past year and a half with a 3G high-speed Internet phone, demands my constant attention just to keep up with who said what. So, no more smartphone, no more Facebook relevancy. That was my logic. So, I went onto Facebook to check to see if there was anything interesting. Nope, just the same old events I can't go to, group invites I don't even read, and status updates about something I don't care about (I realize the irony, if you'd read my current status). I went to send two private messages. "Oops, there was an error sending your message! Try later." Ok, I guess Facebook wants to get cute when their service doesn't even work. I suppose the final straw before wanting to just junk the whole mess was when I went to respond to a wall post, only to find that the sender DEFRIENDED me! Ah, the rejection was too much to bear. Mark Zuckerberg, an AEPi Jewish fraternity alum, is the founder of Facebook. As you could guess from his name and choice of frats, he is a Jew. Though he is an atheist, he is obviously schooled in Jewish culture. Nothing is more overwhelmingly Jewish, in my experience, than the oft-mentioned "Jewish Guilt." In the Israeli Army, I felt guilt over whether or not to be a combat soldier ("Ben Gurion wanted you to be combat, and the country needs you"). With my cell phone provider I was guilted over my choice of phone ("Why do you want to buy a phone overseas? Don't you like our models?"). But Facebook, and Mark Zuckerberg's scheming ways, top them all. 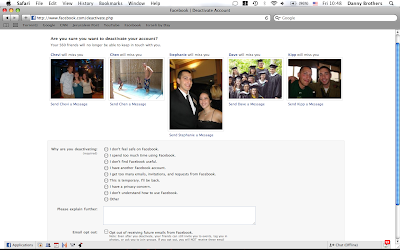 Here's the page that came up when I wanted to remove myself from their service. (Click on it for a close-up). I don't curse on Israeli by Day, in general. But this one deserves a "holy sh*t." Let's take a closer look and examine. According to Mark Zuckerberg and Facebook, if I disconnect, my "friends will no longer be able to keep in touch with [me]." If you're not on Facebook, that's it! You don't exist! No email, no cell phone, no address - no Facebook, no existence. That's pretty intense. Not wasting precious time, Facebook throws five friends in my face, and actually include a line saying that they will miss me. Name by name, they say that "Dave will miss you; Stephanie will miss you." Five times they say that. Normally that wouldn't get to me, and I don't know what kind of genius algorithms they are using, but they somehow picked five good friends out of 560 acquaintances to guilt me with. You might be thinking that they simply picked the five that I talk to the most, but that is not hardly the case. I haven't communicated for a long time with a few of those people on Facebook, but I'd be very sad to lose touch with them completely. I fear that would be the case if it weren't for Facebook. But look closer. Not only did they pick those five good friends, and not only did they include the line that they would miss me, but they included pictures of that friend. Again, take another look. Notice the real guilt trick? All of the pictures are of us together! I'm not even sure what to say, other than that their guilt trip took me a long way. Those pictures happen to all be of very cool experiences in my life. They are meaningful as hell. One is of the Jerusalem Winter Ball in 2009, which I attended during my 10-day vacation from the army for finishing basic training - a great excuse to drink bathtub-quality vodka. Another picture is of my graduation from college, with all of our friends around. Yet another is in the coolest pool ever, in the nicest hotel ever, during one of the greatest weekends I've ever had in Israel. Just look at those pictures: buddies. I can't delete those guys. Facebook gives me the option right beneath those pictures to message my friends. What do they want you to say? "Hey friend, I'm going off the grid. I won't see any of your pictures, read what you're up to through your status updates, or remember where you work. Talk to you later - not sure how though..." Guilt. How could you remove them from your life? They really drive home the message that Facebook is a necessary part of your life, and with an invaluable smartphone, you're never separated from your friends. The scary part of it all is that I believe them. How would I ever remember all those acquaintances that I like to keep tabs on? I do like to see what kind of jobs they have. And my real friends, how will I see what they look like if not for the photos they post? And wow, birthdays. Considering I have forgotten my own birthday once, if Facebook didn't alert me to anyone else's it'd be a sealed matter; no happy bday from Danny! In conclusion, I have lost yet another Nokia phone for no good reason. My days in the army of constant Internet use, an addiction most likely, are therefore temporarily suspended. My Facebook connection is severed. Checking that site once every two weeks is just about worthless. Despite that setback, and my refusal to get another good phone for awhile, I cannot purge Facebook itself. Mark Zuckerberg and his creation have implemented 5,000 years of Jewish history's greatest weapon, and I've fallen prey to it just as if it's one and the same as my grandmother ("Hey, I drove all morning in the rain to buy you two pounds of high-quality deli meat for the weekend, aren't you hungry for a sandwich?"). I guess I'll link to this blog post on my Facebook home page. WHAT HAPPENED? YOU USED TO HAVE INTERESTING POSTS. Show me one interesting post you've ever written in your life, and I'll show you MY blog where I write about things that impact MY life. Funny spin on this blog topic. "Facebook Addiction: The Life & Times of Social Networking Addicts"
I came really close to closing down my facebook too..Maybe God's convicting us about Facebook...and i really did do a clean up on my friends list too.It was hard to close it down because..there are a couple friends on there that..i'm there for..and they're the ONLY REASONS why I stay..the rest is..spam? haha.jk..love the posts. Much peace. Danny, you give me another great reason to stay away from Crackbook. Sorry to hear about your phone though. And it was a good post, regardless of what obnoxious commenters might say. Brilliant post. Reminds me of the ultimate Jewish weapon that Adam Goldberg unleashes at the end of the Hebrew Hammer. As aesthetically ugly and spammy as Facebook is, social networking meets a real-life need as you describe, and that's especially true for those of us who have made aliyah or a similar big move. As for not wanting to see invitations and such -- that's what gmail filters and labels are for. Ha ha that's awesome. Facebook telling you "Chen will miss you. Stephanie will miss you. Your 560 friends will have no way to keep in touch with you." Guilt trip, laid on THICK. i so agree with you. i am graduating college soon and deleting so many "so called freinds" but they are more like i saw them once in class and they freinded me. haha sweet - my picture is on your page and i'm famous by association to you (although i wish they would have picked a different picture)! i'm glad you decided to keep Facebook - i definitely would miss you, Mark Zuckerberg was right! I MISS YOU!!! let's gchat or gtalk sometime ok? Danny, This is a great post! Ignore those comments that are simply ignorant and mean. Stephanie, I love that picture of you with Danny. I remember that weekend well, b/c we were in town visiting Danny. I still wonder what occurred after that gala. I love that my picture came up. Dave - miss you, buddy. i was just telling a friend over here about you the other day. our crazy lambda days. This is the story of my service in the Israel Defense Forces (IDF) as a chayal boded, or a lone soldier. I served in the Golani Brigade and was deployed to the West Bank, Gaza, and the Lebanon and Syrian borders.